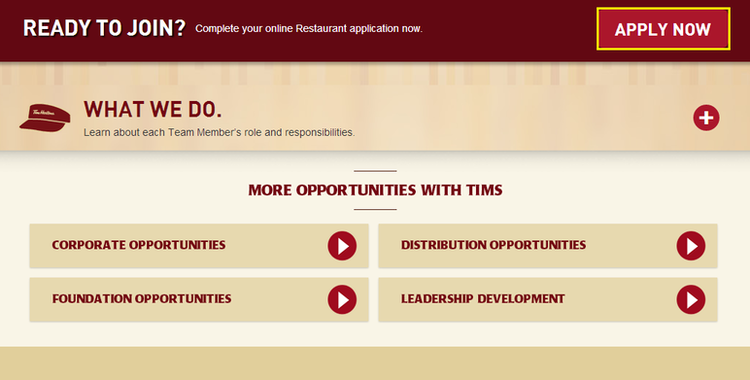 Land on www.timhortons.com/us/en/corporate/restaurant-opportunities.php, then you shall choose a department from corporate opportunities, distribution opportunities, foundation opportunities and leadership opportunities to join Tim Hortons. Or you are interested in restaurant opportunities, you can click “APPLY NOW” at the top right corner to apply for a position. To continue your online application, you need to enter your basic information, your name and date of birth included. In this step, you are asked to select a job category you prefer from management and team member. To filter all the useless information and directly find the pointed jobs, you’d better provide Tim Hortons with certain information about your location, your country, province, city, and a nearby restaurant included. To proceed your online application, you are required in this step to tell Tim Hortons some specific information about yourself, such as your name, phone number, street address, email address and so on, which may in large part show your qualifications and experience. 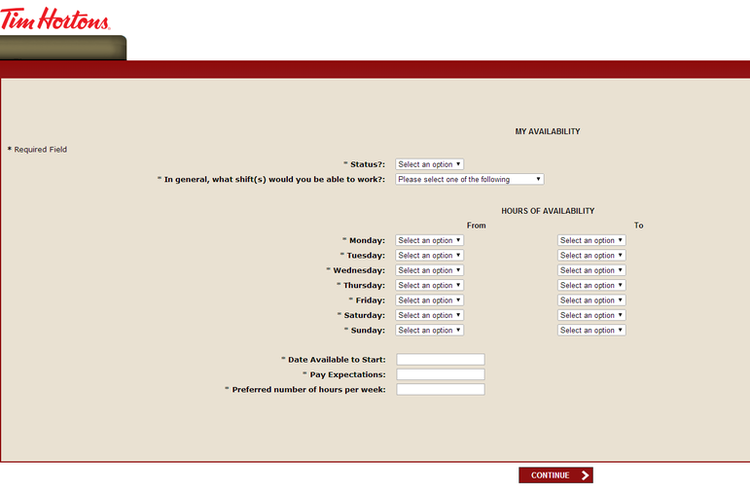 After you have filled out all needed information, click “CONTINUE”. 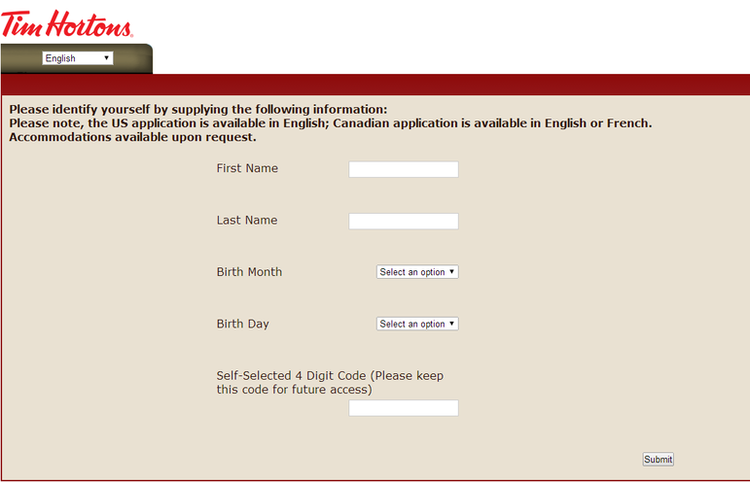 You need to tell Tim Hortons about your availability your pay expectations to continue your online application. In this step, you are asked to provide Tim Hortons with your employment history. You experience may prove you to be qualified for the job in Tim Hortons. 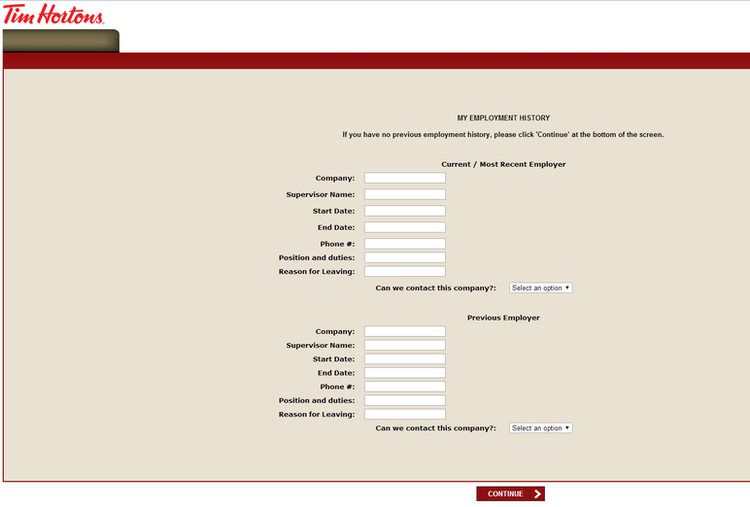 Click “CONTINUE” if you don’t have any previous employment history. You need to submit relevant references to continue your online application. Note that do not list any relative. A Tim Hortons’ acknowledgment will be show on the new page. 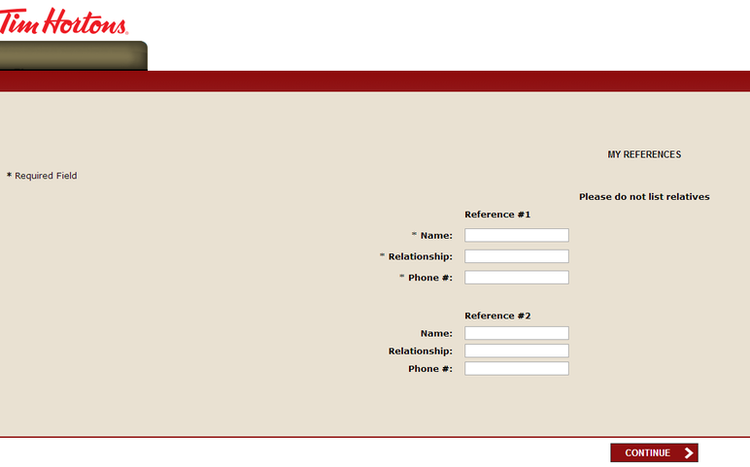 Show your agreement to it and your online application will be completed and sent to your chosen restaurant. You will contacted if you are proved to be equal to the position. Click timhortons.com/careers to apply for Tim Hortons jobs online. Hannah Diopenes 2017-04-17 17:02:57 Rated 5.0 Hello Sir... I really want to be part of your company.